As I mentioned the other week, the boys took a fun trip to Park City for some skiing, movies and parties. We succeeded on all fronts. It was such a good weekend that we didn't have a lot of time to eat out. Monday night was our lone opportunity and it was jammed in between movies. Bangkok Thai on Main had an opening and it was centrally located. We ate quick and the food was pretty good. Our service was pretty bad, spilling beer, messing up orders and having a hard time tracking down our server (when I asked a different server if I could give him our bill he replied sharply "no, give it to YOUR server). Anyway, the food was ok, the beer was pretty good and the portions were large (though we did pay for it - something James called "sundance pricing"). Apparently Bangkok has an award winning wine list, I guess we'll have to find out next time. Everyone has such great things to say about Anteprima, unfortunately we did not get to taste all those praises. We were in the mood for a good Italian dinner and more than a few friends have encouraged me to take Anteprima off my wish list. It also helps that there is a three course "meal" (not really a prix fixe...) for $29 Sunday through Thursday with very little restrictions. Even with a great price and great hype, the food did not perform. The most common flavor was little flavor at all. "Bland" was the word of the night, which is hard to fathom for Italian food when all you have to do is add olive oil and garlic. Oh well, not our best meal but you can't win them all. The three course "special" allows you to choose one entree, and any two other dishes (half pasta, dessert, starter - it doesn't matter the combination). I was impressed with the size and scope of the menu, especially since a lot of choices push the envelope of "traditional" Italian cuisine (i.e. NOT Maggianos or Mia Francesca). But what concerned us was that even though we had six dishes to choose for dinner, we had trouble finding that many that looked appealing. I realize we might have been acting picky, but that is usually a red flag in my mind that my personal taste preferences might not match well with the Chef's. We decided on a celery salad, two small pasta starters, one large pasta main, halibut and a dessert. I wanted to get another post done before leaving town again, but I ran out of town. The guys are headed off to Park City, Utah for some fun in the snow, good movies and parties. The last thing on my mind will be gourmet food, so please excuse my absence and I hope to return to my regularly scheduled programming next week. Fingers crossed for smooth flying and new snow! What a great name for a wine bar and BBQ place. What's even better is the quality of food per $$ spent after a long day of wine tasting in Napa, CA. I would not expect to want ribs and BBQ after all those great Cabernets and Merlots, but I can assure you I did not want any wine with dinner. Bounty Hunter is a great mix of wine bar (for those still needing some more fermented grapes) and BBQ spot all rolled into one approachable and fun atmosphere. You can even sit in a saddle at the table if you so choose. 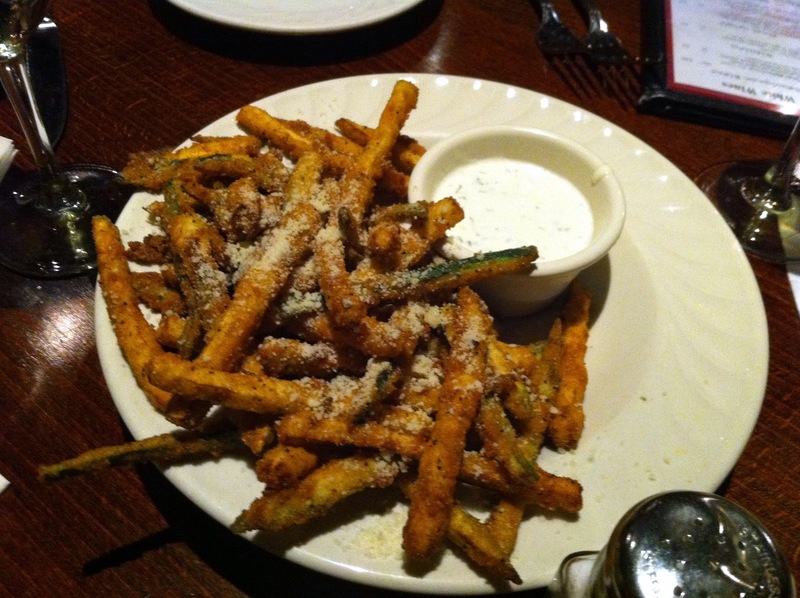 The menu is simple and straightforward but offers plenty of options. We started with an artichoke and spinach dip that was more artichoke and less cheese/spinach than I had ever tasted. Not my preferred style but still tasty. There were a few beef brisket or pulled pork sandwiches ordered in addition to my full rack of ribs. However Erica and Alyssa stole the show with a beer can chicken that came to the table in full bird glory. We were quite amused since Erica had just recently made one at home, and this must be one of the few restaurants in the country to serve one to the public like this. 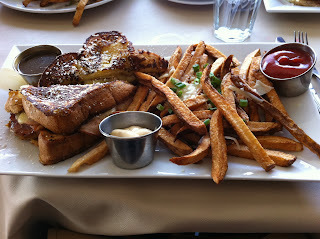 We completed our 24 hour downtown St. Louis culinary tour with a fantastic brunch at Lola. Actually, we wanted brunch but did not realize until we sat down that “brunch” only qualifies on weekends. The menu still looked good for “lunch” so we made do with great food. I was still in a breakfast mood (something about the first meal of the day…) and found the perfect dish – ham and cheese sandwich served on French toast with maple syrup and French fries. It was very good, not too rich and extremely filling. Everyone received fries with their order and thank goodness, because no one would be willing to share. The aioli sauce was a great compliment. DMK is still the best food serving establishment in close proximity to our apartment. We went a few times after it opened in 2009 but have since spent more time exploring Chicago’s vast dining scene (i.e. I Like to Eat). I am glad we decided to reacquaint ourselves with the Burger Bar because they have only gotten better with time. The menu is complete though still focused on burgers while the sides have been perfected. What brought us back to DMK recently was their great New Years Eve party special - $75 for drinks and passed food all night at a table. It was a great way to ring in the New Year with good drinks and more food than we could handle. They also introduced their “breakfast burgers” after midnight (meat, eggs, cheese, etc on a bun – delicious). After our fun night with friends, Erica and I decided we would return for a proper meal and enjoy the close proximity of high quality food. On our drive back from Arkansas (thankfully before birds and fish were dying everywhere...), we decided to go via St. Louis to hang out with Jon and break up the long trip. I still have not figured out why driving all day makes me tired and hungry. It makes no sense but the only cure is to find food and a bed. The best idea we had for a chilly Monday night was Jade - a nearby asian/chinese/sushi/party lounge. It was understandably empty which only meant we had great service. MNF beer specials didn't hurt either. The three of us kept it simple, ordering Mongolian beef, noodles with chicken, and a few sushi rolls. 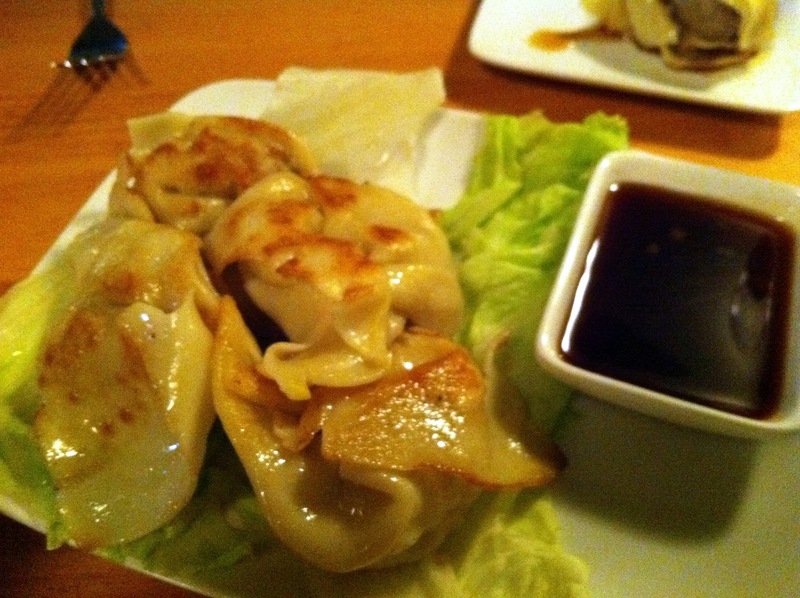 We started with chicken pot stickers. I've had to pleasure of eating and tasting my way through the Maude's menu the past two nights (last night with the now engaged! Mish and Doug) during their opening week. A word of advice: it's on the smaller side and seating is limited, book in advance. The upstairs "lounge" area is gorgeous, dark and fun - and also very popular (try to reserve if possible). The decor is well documented as fresh and quirky, but well composed. Individual items may seem in contrast and out of place, but that's the point and it works. 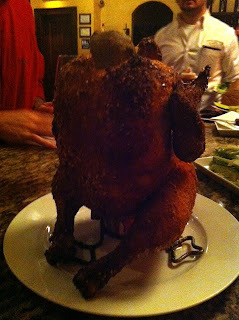 The drinking and dining are first rate, highlighting a playful use of ingredients and showcasing extreme culinary skill. I have not tasted everything on the menu but I have yet to find any "misses." My least favorite dish was escargot, though that's just because I've never had it before and they are drenched in garlic butter. I love butter and garlic, but I wouldn't know what good snails should taste like. I would prefer to save my consumption of fat and butter to other dishes. Finally, our favorite dish thus far is the french onion fondue. Think french onion soup without the soup. Incredible. I'm doing my best to get back on track and up to date with my experiences. This post finishes our quick trip to Arkansas in December. The occasion was my father's 70th birthday celebration so we let him choose his dinner spot. We spare no expense for birthday dinners in the Rapp family and choose Conway's finest in Mike's Place. It was immediately apparent why Mike's is an institution. The fireplace is burning by the door, children are more than welcome and the food is high quality, local comfort food. 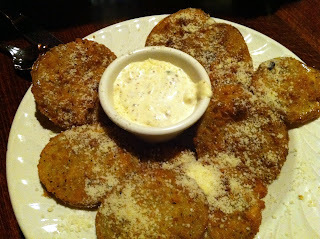 We started with southern classics - fried green tomatoes and fried okra. 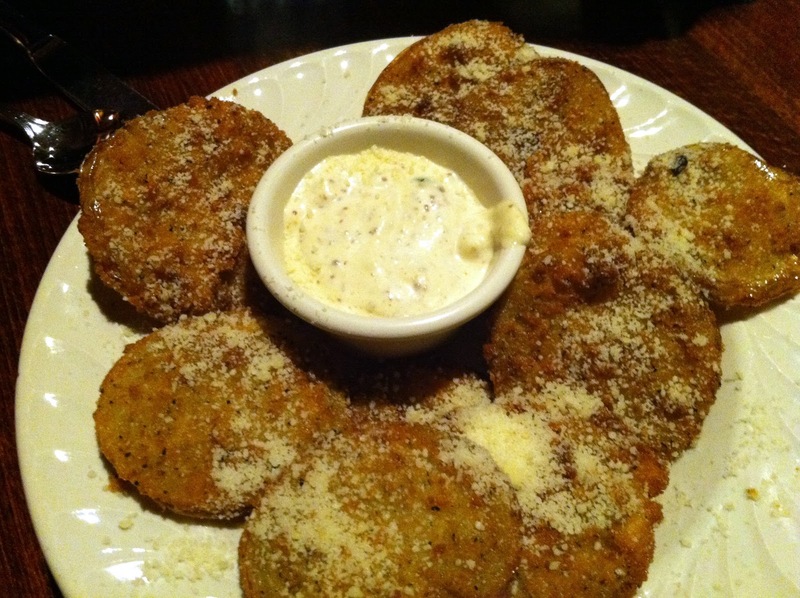 I might prefer my vegetables non-fried, but you can't deny the tastiness of good southern flavors, fried or otherwise. Happy New Year! I'm a little late getting back into the swing of things. My trip to Morocco went well and we ate plenty of great food. I won't take the time to chronicle our meals because I'm way behind other meals. I wasn't surprised the food in Morocco was as good as it was because all the books and people say it's delicious. We ate plenty of couscous, tajine, lamb, chicken, etc. The pizza in Morocco was also surprisingly tasty. Our first dinner in Marrakech was one to remember, a full dinner and show experience located down a dark alley in a private riad featuring more courses than we needed, singers, musicians, and belly dancers. Anyway, I know all the rage in the food writing world is to recap and highlight "The Best of 2010" in as many lists as possible. It's kind of a silly exercise since we all ate different meals at different places, but I'll throw in my two cents. I look forward to another full year of tasting my way across the city (and world for that matter) in 2011. I'm not planning another bonanza world travel year and hope to post more regularly and often. Cheers to more great food and thanks for reading!